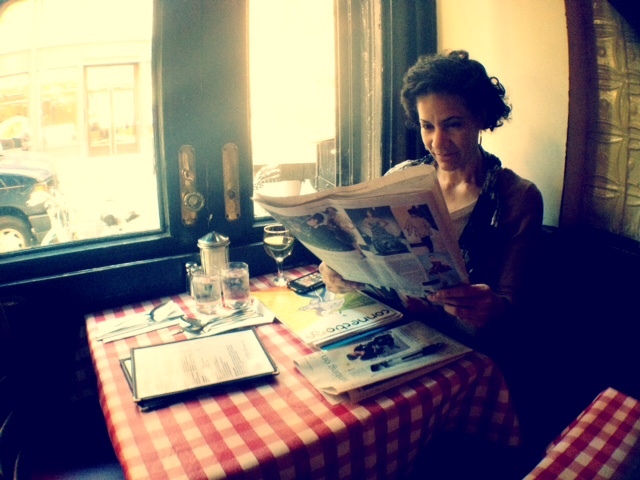 Having lunch at Fanelli’s Cafe today. Usually when I come here I’m perched at the bar enjoying a cold beer or a glass of Pinot G after work. 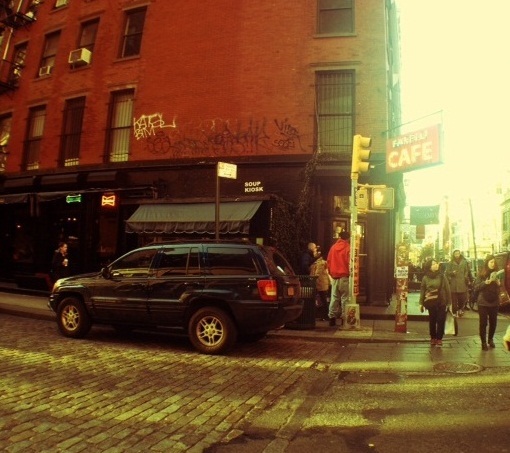 The atmosphere is typical SoHo. Faded industrial elegance with a side of modern, casual coolness. The circa 1840s architectural details are perfect accessories that punctuate the mood of the place, toned down by muted textures that come only from years and years of re-plastering and repainting. I really like it. Places like this beckon me. So ye ah, lunch with a friend today. He’s late. Or am I early? We’ll split the difference. I pass the time reading the paper, sipping wine and gazing outside at the beautifully imperfect cobblestone street. Correction – beautifully imperfect Belgian block street. I recently heard by happenstance (okay, by eavesdropping on a crowd of tourists) that many of the streets in SoHo are paved with “setts,” rectangular quarried stones, a.k.a. Belgian block. Cobblestones occur naturally and they’re round. Lots of cobblestone streets are found throughout the outer boroughs, but I think these small blocks are equally charming. Heeey, there he is; alrighty then. A quick share before I put my laptop in sleep mode: I don’t mind much of anything these days because I’m home, and from my perspective it’s all good. After a 19-year TX detour, change in game plan or simply how the universe decided to play it, I am home. It doesn’t matter anymore how I got here. My soul is at peace in ManHAttan. We’ll be eating burgers today, for which Fanelli’s is very well known. Medium rare, with mayo and onions on the side. Want to check out this place next I am in the city.